Adopt the GOOD PUPPY® Children Behavioral & Emotional System and get your own super sidekick. The perfect tool for teachers of children, ages 3 to 9. Designed to curb behavior through pre-established consequences, positive reinforcement and emotion identification, the system communicates through humorous empathic images children can understand from a very young age. Implement GOOD PUPPY® Tools in school, introduce them to the student's parents, friends and family. Be a true GOOD PUPPY® School, a guiding light to goodness. The softcover book/toolkit for classroom reference and use. To be used with the GOOD PUPPY® Pack Hanging Set. The emotions communications tool for children, ages 3 and up. 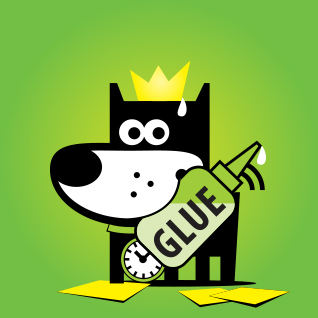 Sign up for GOOD PUPPY® Adoption and get special access to GOOD PUPPY® products & tools. Quantities are limited. So, hurry! Adoptions are currently offered to one class per school within the U.S. mainland. To inquire about adopting from outside the US, please contact us. Inform student’s parents about it. Support it through social sharing. As a GOOD PUPPY® School, you'll have access to the latest GOOD PUPPY® Tools, news and marketing. So, share the love and spread the GOOD word online and off! You can always start by following GOOD PUPPY on facebook, twitter, youtube, Pinterest or Instagram. We hope to see you there!